Our range of products include three-axis joystick oil hydraulic micromanipulator, gm-89 motor drive manipulator, narishinge microgrinder, gmo-202nd three axis joystick, mf-900 microforge and eg-400 microgrinder. 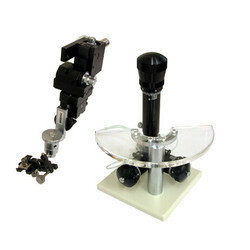 MO-202U (Legend Symbols)Three-axis Joystick Oil Hydraulic MicromanipulatorReturn of an acclaimed design with outstanding ease of use.This oil hydraulic joystick micromanipulator won considerable attention as an innovative model as soon as it went on sale, principally because of its smooth three-dimensional operation using a single lever. Since that time, it has been widely used by many customers, whose requests for restoration of its former shape and other discontinued features are met in this latest model. Those features include the tall upright joystick control section with plastic hand-rest and full, 500m rotation movement. In addition, a slimmer driving unit and attachment of the UT-2 as an accessory make this model easier than ever to use. 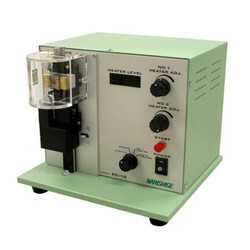 EG-44 (Legend Symbols)MicrogrinderMinimizing irregular movements on the grinding plane for greater precision.This grinder is ideal for grinding micropipette tips, thanks to its employment of a special motor which is designed to minimize irregular movements of the grinding plane. In addition, this model provides stable performance at all revolution speeds - from low for more precision to high for faster grinding. 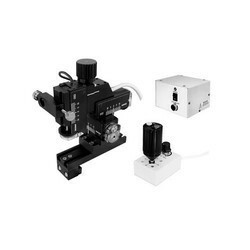 An easily operable coarse and fine movement coaxial manipulator is equipped for vertical operation of the microneedle, which also enables very precise grinding. A protractor is mounted on the needle holder fixing section, making it easy to set the required grinding angle, and an adaptor is attached for vertical grinding. New water filling and drainage mechanisms are installed to prevent clogging or the accumulation of shavings, making the apparatus as a whole much easier to use. MF-900 (Legend Symbols)MicroforgeMultiple functions for making different kinds of microtools Reflecting Narishiges long practical experience, the MF-900 offers a wide range of functions for making many different kinds of microtools by processing microneedle tips. 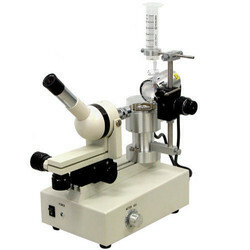 An easyto-use manipulator is provided for operating the heater and pipette, and the microscope is operated three-dimensionally with control close to the operators hand. Separate rotation mechanisms for vertical and horizontal movement allow the pipette to be approached at any angle, while a special device in the heater section can form it into any required shape. 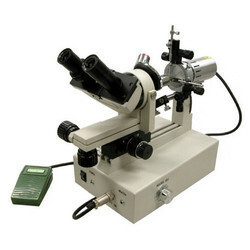 As well as conventional scales, a protractor to measure angles is provided on the microscope eyepiece. 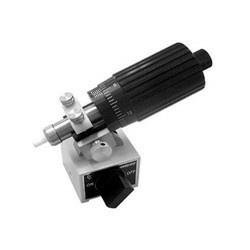 With the heater turned ON/OFF via a foot switch, and the heater section integrated into the microscope body, all control actions are performed easily and precisely close to the operators hand. A new mechanism is incorporated which improves the parallelism of the plunger within the syringe and prevents the development of any play. Reducing fluctuations of the handle tension, which have manypossible causes, makes control much smoother. The new mechanism and drive sections are built into the handle, while the handle itself is made larger: however, the overall design is smaller, and operability is improved, with a higher driving volume faciliting a greater control volume. The syringe is made of highly durable and precisely processed stainless steel, while the attached glass syringe is accurately made and allows the operator to choose a preferred type. 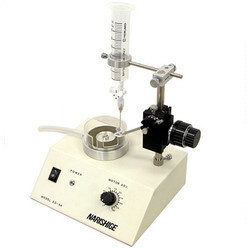 The specification of this model allows precise control of both injection and aspiration: we recommended its use at the injection side after it has been filled with oil. PC-10 (Legend Symbols)Puller Vertical pull type with automated double mode for improved versatilityThe method used by this puller is to pull the glass capillary vertically, using the gravitational force of its own weight. For more versatility, two modes are provided a single pull, which pulls at one stretch, and a double pull in which the setting is change in mid-process. The PC-10 can therefore produce long, thin microneedles for injection purposes, and firm microelectrodes for patch clamping. The change of setting in the double pull mode can be preset and then performed automatically, which represents a significant saving of labor over conventional methods. Digital values, with the maximum output of the electromagnet and heater represented as 100, are shown on the display and the heater output is continually increased, making accurate mass production easier. This puller has several simple features to enhance ease of use, such as the employment of two weights (light and heavy) for tension adjustment. 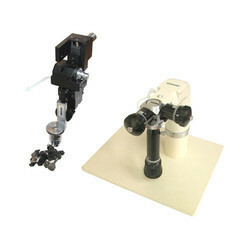 Looking for Narishige Micromanipulator ?